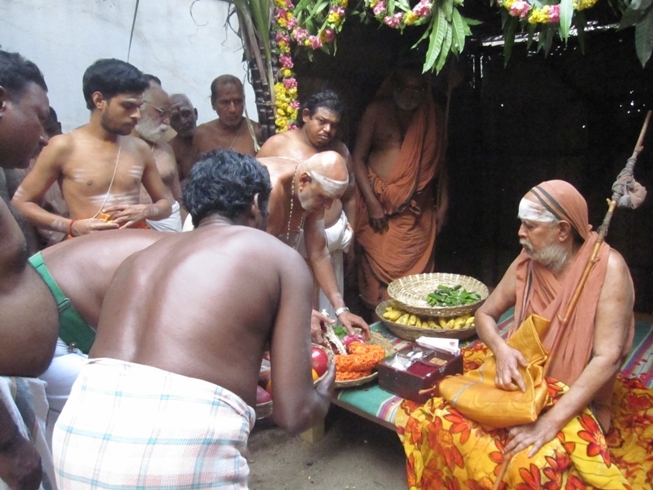 Mattu Pongal was celebrated at Shrimatham, Kanchipuram on 15 January 2014 in the benign presence of His Holiness Pujyashri Jayendra Saraswathi Shankaracharya Swamiji. 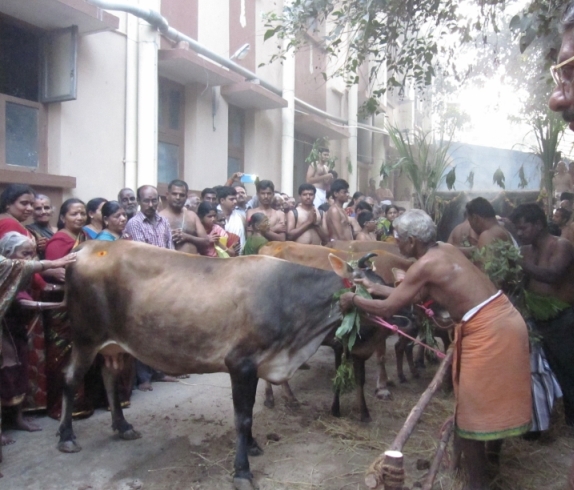 The cows in the Shrimatham Goshala were decorated and worshipped with special pujas in the presence of Their Holinesses. As part of the Nitya Chandramouleeswara Puja, Go-Puja is performed every day at Shrimatham. Ancient scriptures highlight the importance of the Cow. In the Rigveda, there is a �Gosukta� . 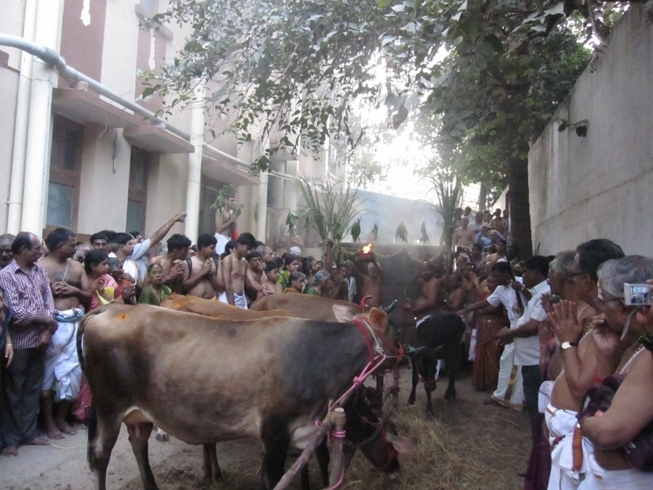 It is believed that all the devas reside in the cow. In His Prashnottara Ratna Malika, Adi Shankaracharya asks "And who is the mother?" and gives the reply "Cow." The cow not only has an important place in our Sanatana Dharma, it is also an important animal for the economic growth of India. As part of an effort to protect cows and give them love and care, especially when they are considered unproductive, Shrimatham has established Goshalas at various places and is maintaining such cows. 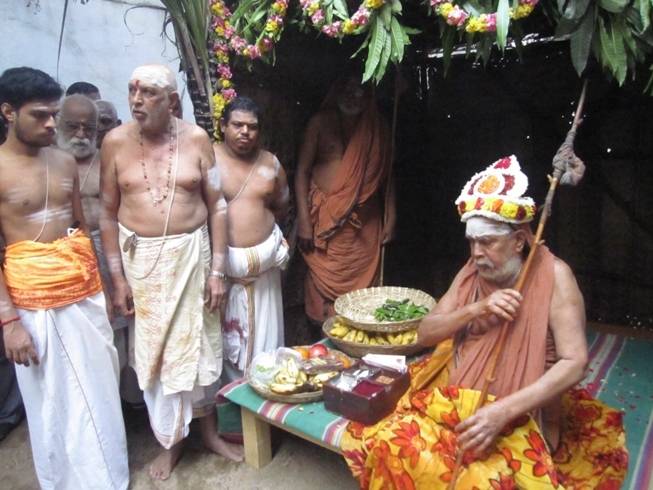 CARE OF COWS: The following is a message given by His Holiness Jagadguru Sri Sankaracharya of Kanchi Kamakoti Peetam on July 1, 1958 on the occasion of Vyasa Pooja. Though we have a tradition of worshipping the cow, most of us do not care for cows in the proper manner. Our country has the largest number of cows in comparison with other countries. But the milk yield is very poor, and the average quantity of milk we drink is the lowest in the world. Most of the cows which are slaughtered are bought from Hindus by butchers. One of the main reasons for this thoughtlessness is the want of fodders for cows. We have also forgotten our religious obligations in respect of the cow, on which the economy of our country is based. Even those who maintain cows in their own homes are not completely free from the sinful omission to take proper care of them. One easy method of providing fodder for the cows without any cost is for housewives, hotel-keepers, and hostel authorities, to carefully preserve every day, in a neat and sanitary place, their kitchen garbage, such as wastage from plantain leaves, skins of all fruits and vegetables, the water after washing rice, and the kanji. Now-a-days these are thoughtlessly thrown away in the street and roundabout dust bins, adding to the work of our patient sweepers. If our people will only take a little trouble to preserve them, and, if an organization like the Pinjrapole or a group of cow-owners can arrange to come round daily and collect them, the amount of fodder that will be thus available to our cows will be considerable. This small thoughtful action in our homes, hostels, and hotels, will go a great way to provide for the cows and augment the cattle wealth of our country. In addition to serving to removing the slur on our nation that we do not care for our cows, it will also obtain for us untold religious merit by the performance of this holy duty.